On the 26th, in my posting “croquet monsieur”, a return to the croque-monsieur sandwich and its variant with a fried egg on top, the croque-madame. At which point a Facebook reader suggested that the croque-madame was à la Holstein — a reference to schnitzel à la Holstein, whose primary addition to the basic schnitzel is a fried egg on top. 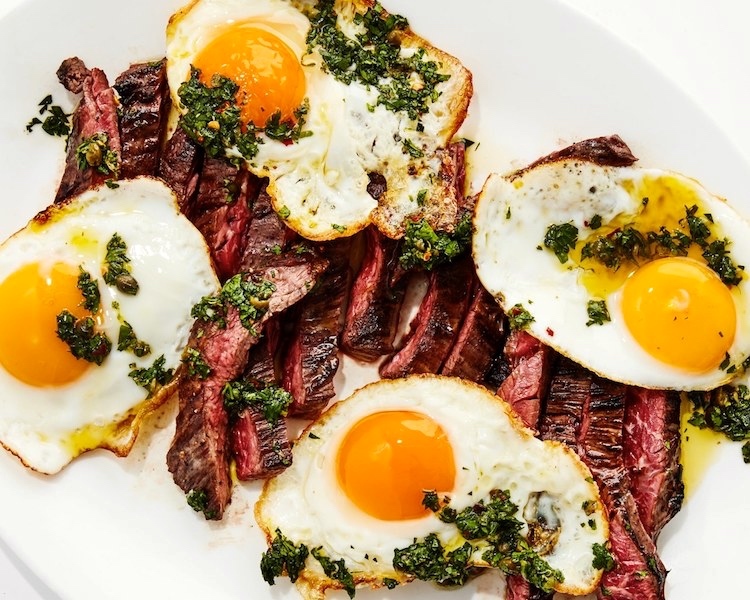 There is, in fact, a school of thought that anything (well, anything savory) goes better with an egg — fried, poached, or raw — on top. Oh, the many variations on the schnitzel theme. There’s the basic wiener schnitzel — a veal cutlet pounded tender, breaded, and fried — found, with different regional flourishes, throughout central and northern Europe. This revamp was cooked up in the late 19th century at the Berlin restaurant Borschardt, to please the palate of one Friedrich von Holstein. 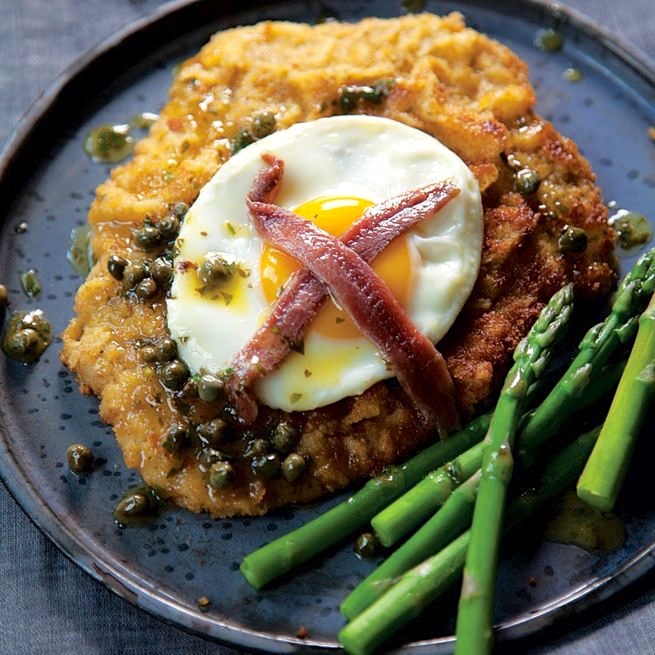 The crisp-fried veal topped with luscious egg and salty anchovies and capers is a brilliant study in contrasting flavors and textures. The material in boldface is repeated, with only minor variation, in a number of other recipes on the net. Without any account of the restaurant or any identification of the Friedrich von Holstein in question. Both, as it turns out, are quite famous. Friedrich August Karl Ferdinand Julius von Holstein (April 24, 1837 – May 8, 1909) [from a distinguished family from the Baltic coast Mecklenburg region, allied with Prussian Western Pomerania] was a civil servant of the German Empire and served as the head of the political department of the German Foreign Office for more than thirty years. He played a major role [as an eminence grise] in shaping foreign policy after Bismarck was dismissed in 1890. 7. Borchardt: This old-school celebrity hangout is home to Berlin’s most famous Schnitzel. Although the Borchardt’s Wiener Schnitzel (just like its audience) has definitely has seen better days, it still remains a great Schnitzel and if you’re into to people-watching as well as waiters with white shirts and black vests then this is the Schnitzel for you. The reference to people-watching is an allusion to the fact that the restaurant (which offers French, German, and Austrian dishes, plus a well-reviewed cabaret) is trendy and thick with celebrities. 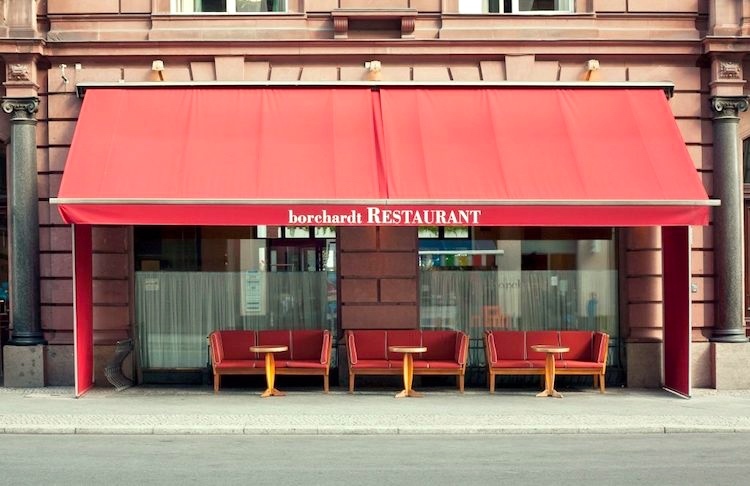 Meanwhile, the name of the place is spelled Borschardt in several recent touristic reports about Berlin, some of which characterize it as the “see and be seen” restaurant of Berlin. I’ve found no explanation of the spelling variation, but it seems pretty clear that the current celebrity-magnet place is a continuation of the fin de siècle restaurant that catered to von Holstein’s food whims. Eggs Benedict … is a traditional American breakfast or brunch dish that consists of two halves of an English muffin topped with a poached egg, bacon or ham, and hollandaise sauce. The dish was first popularized in New York City [in the late 19th century; there is dispute about the details of its origin]. Many variations on the basic recipe are served. 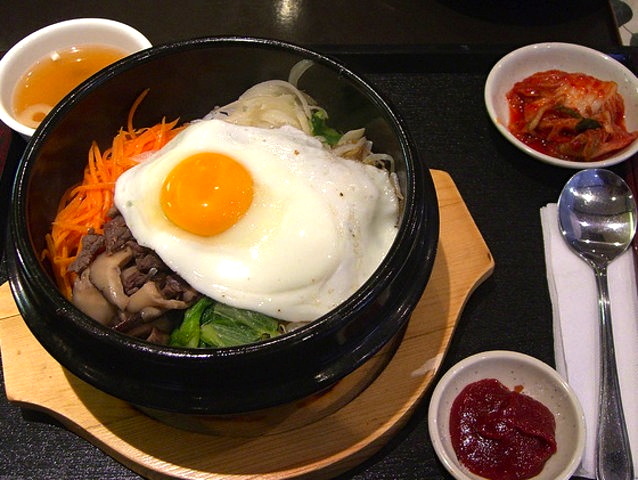 Fried egg for breakfast, fried egg for brunch, fried egg for lunch, fried egg for dinner. This entry was posted on November 27, 2018 at 9:52 pm and is filed under Language and food. You can follow any responses to this entry through the RSS 2.0 feed. You can leave a response, or trackback from your own site.